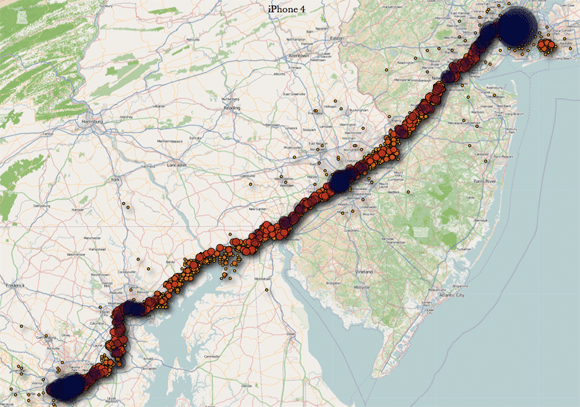 The news broke out at where 2.0 that if you pull a .db file from your iphone, it has a record of everywhere you have been in the past year. WOW. Worse, this file in NOT encrypted. So the question is; why are they collecting this in the first place? Perhaps the government wants it? A way to improve accuracy of the GPS? A way to report back to ATT where dead zones are? Apple is not talking of course, and given that I do not go anywhere interesting, I’m not that concerned that its being collected. What REALLY concerns me is that the file is just sitting there! Talk about insecure! Comeon? How hard would it be to simply encrypt this file? Credit to Alasdair Allan and Pete Warden for breaking this. They also created an app to view this data. Get it here.. This is Mac only at the moment. Once someone writes a script for PC I’ll post it up. Below is a video where they talk about this during the Where 2.0 conference.